You are at:Home»Herbs»Ephedra vulgaris Rich. Latin name : Ephedra vulgaris Rich. Description : Ephedra is acrid tasting, alterative, antiinflammatory, antispasmodic, antitussive, aphrodisiac, astringent, bronchial dilator, decongestant, diaphoretic, diuretic, expectorant, a strong stimulant and has been used as a treatment for asthma in Chinese medicine for over 5000 years. In 2700 BC, Shen Mung, the first Chinese herbalist used the dried roots and stems as a decongestant to treat asthma, colds, coughs, fever, hay fever and headaches. 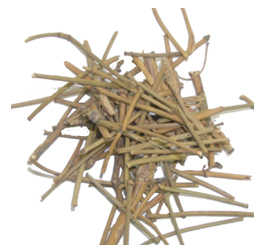 It is the natural source of ephedrine commonly used for diseases of the respiratory tract with mild bronchospasms in adults and children over the age of six. Various indications include asthma, whooping cough, congestive sinus problems, cardiovascular stimulation and as a stimulant. Useful in hypotension and increases alertness. The natural form has advantages over synthetic as it is better tolerated, causing fewer heart symptoms. Allergic reactions respond well to Ephedra because of its action on the sympathetic nerves. Ephedra is used as a performance booster; to increase the blood circulation to the muscles for energy and endurance from an increase of oxygen and nutrient supply. It is used in herbal weight loss products along with caffeine for its acute thermogenic and lipolytic effects on basal metabolism. It has been proven effective in its ability to stimulate thermogenesis. Recommended Dosage : 300 mg to 1.2 g powder. Contraindication : In large doses, ephedra, causes nervousness, headache, insomnia, dizziness, manic episodes, palpitations, skin flushing, tingling, nausea, vomiting, anxiety, and restlessness. Toxic psychosis could be induced by ephedrine. Skin reactions have been observed in sensitive patients. Patients with high blood pressure and diabetes should exercise caution when using this herb. Do not use during pregnancy or lactation and in children under the age of 18. Do not use ephedra in conjunction with monoamine oxidase inhibitors, steroids, beta-blockers, or antidepressants.